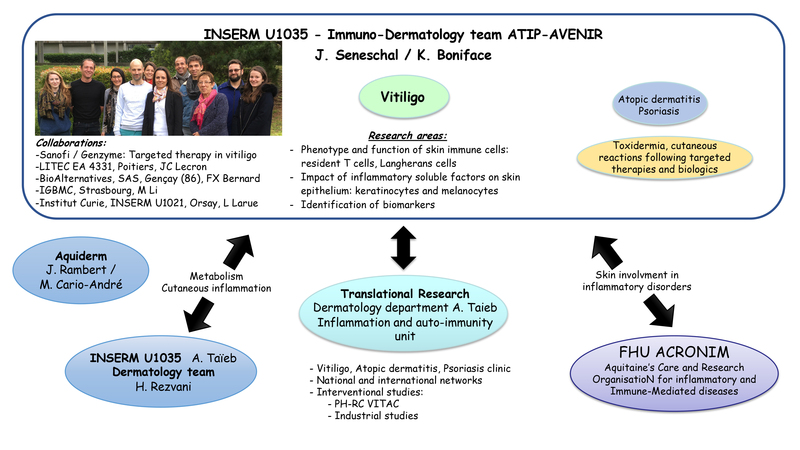 The immuno-dermatology team is focused on the immune mechanisms involved in skin inflammatory diseases, in particular vitiligo, the most common skin depigmenting disorder. Based on a strong clinical research program dedicated to this disease in the department of Dermatology and the support of international groups (such as Vitiligo European Task Force), we have developed basic and translational research studies exploring both the innate and the adaptive immune responses in vitiligo, leading to the discovery of the role of the Type I Interferon signature in the initiation of the disease together with the involvement of resident memory T cells expressing CXCR3. We now explore the role of these cells and inflammatory cytokines produced on the function, survival and adhesion of melanocytes, the cells responsible for pigmentation. Our work aims to better understand the link between immunity and melanocyte loss in vitiligo. Patents have been submitted for the development of targeted therapies in Vitiligo and close collaborations have been developed with national and international academic teams and industrial partners. Moreover, our research could be generalized to pigmentation disorders affecting inflammatory skin diseases, such as psoriasis, atopic dermatitis, or scleroderma. Our team is part of the Fédération Hospitalo-Universitaire ACRONIM, University of Bordeau,x and works in collaboration with the immunology unit (CNRS, UMR 5164 ImmunoConcEpT) on the pathogenesis of systemic diseases, as systemic lupus disease or scleroderma.